it seems to have improved my concentration and brings a gentle calm over me as i am usually naturally overstimulated. Not like other ginsengs that give you a lot of energy it seems to enhance focus for me. Sort of good price too. 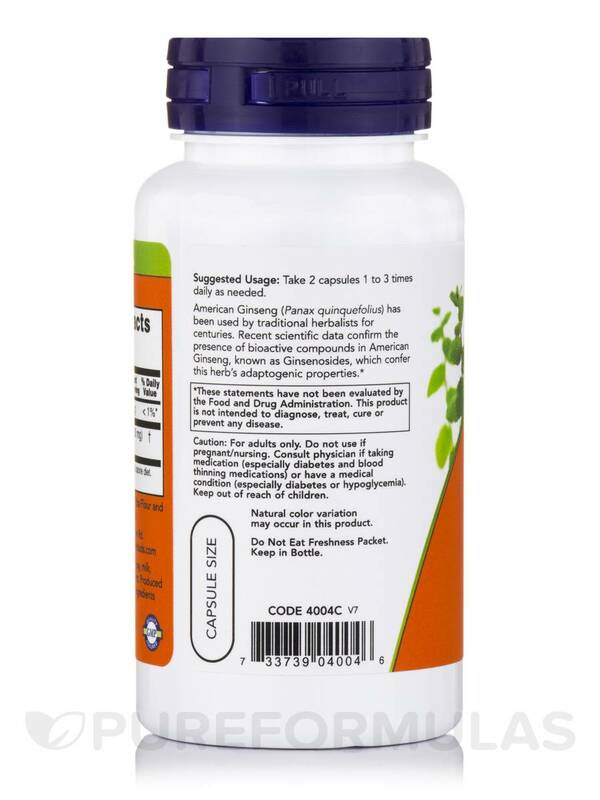 American Ginseng Capsules from Now® Foods is an adaptogen that may help you fight stress‚ provide energy and improve cognitive ability. American Ginseng is an herb that grows in North America and contains chemicals called ginsenosides that may promote healthy insulin levels in the body. This herb has been traditionally used by many as an adaptogen‚ a substance that relieves both physical and mental stress. 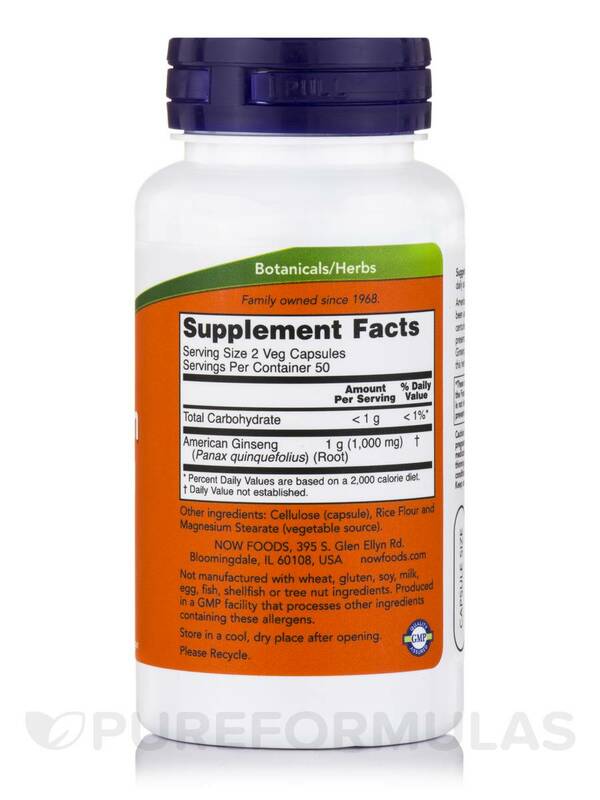 Therefore this supplement from Now® Foods may be your answer for mood balance and cognitive function. A recent study done on this herb revealed that American Ginseng may work towards controlling the common cold‚ as it contains antioxidants. Rich in zinc‚ Vitamin A‚ C and B6‚ American Ginseng has been reported to have beneficial effects on the adrenal glands and kidneys. It is the adrenal gland that secretes hormones that may reduce stress and anxiety. This herb may increase the levels of estrogen in women and may relieve menopausal symptoms. 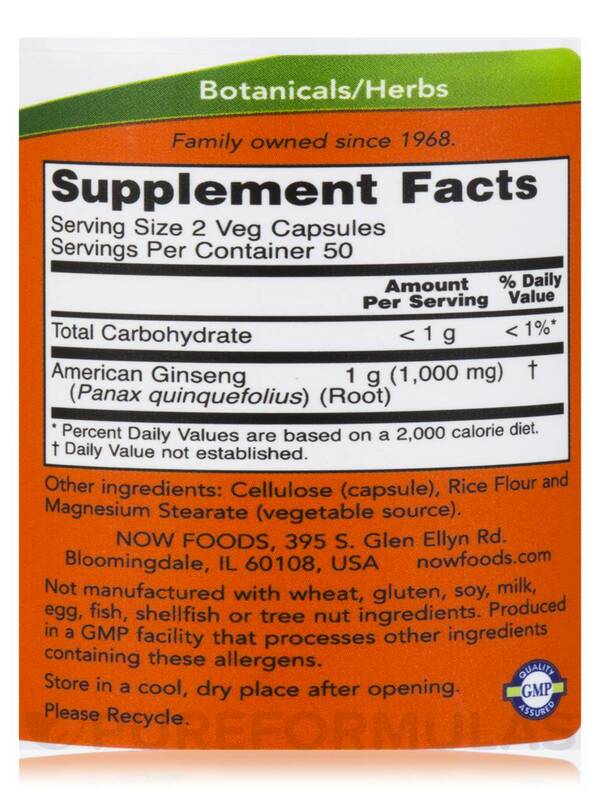 Use American Ginseng Capsules from Now® Foods for better health. Other Ingredients: Cellulose (capsule)‚ Rice Flour and Magnesium Stearate (vegetable source). Do not use if pregnant/nursing. Consult a physician if taking medication (especially diabetes and blood thinning medications) or have a medical condition (especially diabetes or hypoglycemia). Veg Cap American Ginseng! YEA! 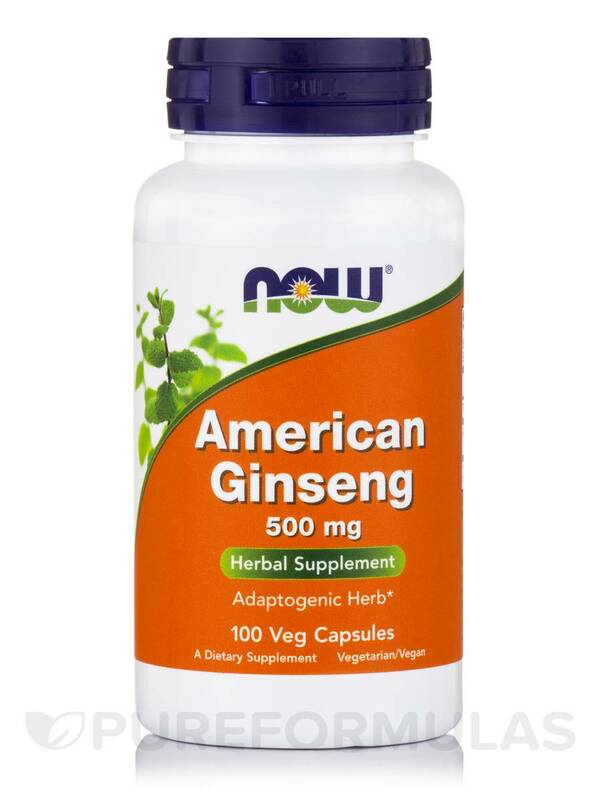 American Ginseng 500 mg by NOW is a good product and is at a great price. Plus, it contains veg caps, so none of that filthy pig gelatin. Of all the ginsengs, American ginseng is the most mild in the sense that it will not overheat your body and drive you to madness. This is also a helpful fertility herb for those in the midst of perimenopause. Great price, Free shipping, and Vegetable Capsules--NO pig gelatin! I wish it was in a glass bottle and not in plastic. 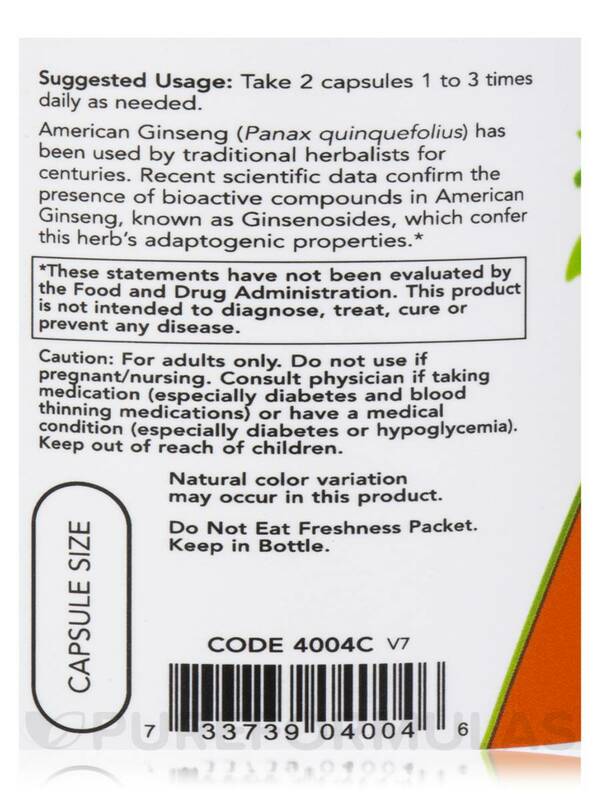 My doctor recommended "American Ginseng 2,000 mg per day" due to the side effects that I'm having from chemotherapy. He said it helps his patients for memory loss. So, I'm excited to start it and hope for great results. I called PureFormulas to ask about American Ginseng by NOW and the customer service representative was helpful and friendly. They delivered it before the promised date and I've had no problems taking this product. My doctor has me taking 1,000 mg with breakfast and 1,000 mg with lunch. This price was better than Whole Foods where my doctor suggested purchasing it. I will definitely order it again from PureFormulas and will let my doctor know so he can pass it on to his patients. Cost effective and natural. I'm glad I found pureformulas on Amazon. I haven't had any negative side effects.